Check out these live streams for what’s happening on the ground. 7:57 a.m. HKT [19:57 p.m.]: Police are clearing the Admiralty. 7:10 a.m. HKT [19:10 p.m.]: Police clear the last barricade on Connaught road that leads to tent area and main stage. Protesters are putting out their umbrellas. 06:55 a.m. HKT [18:55 p.m. EDT]: BREAKING NEWS. Police at Queens road is armed with shields and tear gas. Mobile cranes guarded by officers are in Mong Kok and also in Central. Protestors hope police will keep promise not to clear barricade leading to main Camping gd. 06:32 a.m. HKT [18:32 p.m. EDT]: BREAKING NEWS. Hong Kong police is forming lines at Queens Road ramp. More than 50 policemen have gathered at Connaught Road and Jackson Road, and around 200 are at Connaught Road Central and Queensway. They are setting up speakers. 06:00 a.m. HKT [18:00p.m. 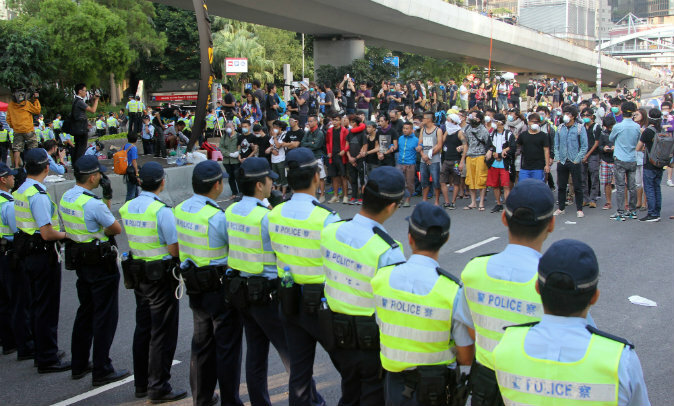 EDT]: Police started to negotiate with students about moving barricades at Mong Kok.